We know many things about the 1981 triple murder of Fred A. Alvarez, Patricia R. Castro and Ralph A. Boger. We know that the bagman for the hit, Jimmy Hughes, confessed. We know that a 2010 trial was interrupted when charges were abruptly dropped and evidence lost. We know from witness statements that the murders, which predated Danny Casolaro’s alleged suicide, could be connected to the corruption surrounding Wackenhut and the PROMIS affair. 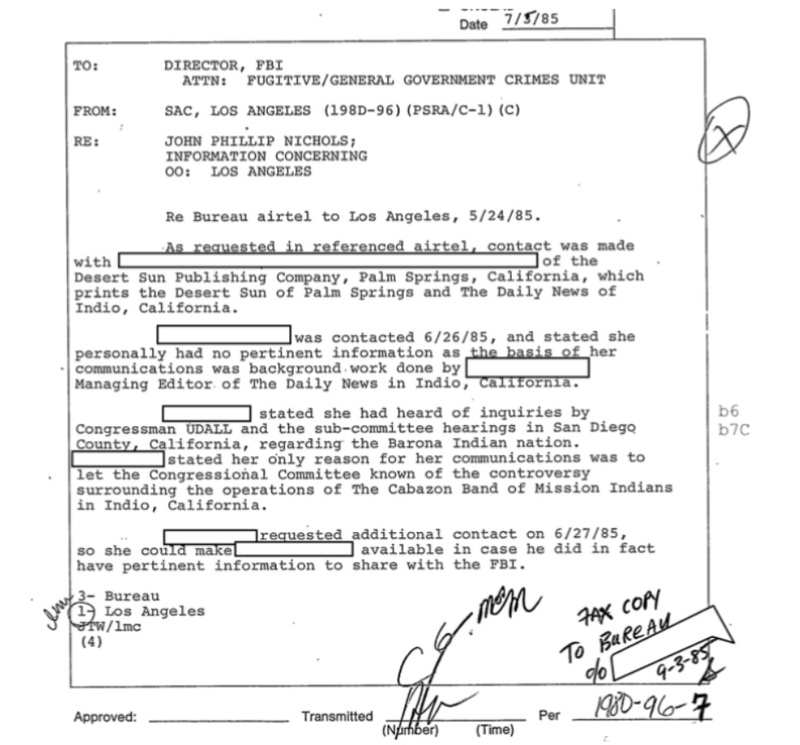 We know from the FBI’s own records that the Bureau looked into the matter. 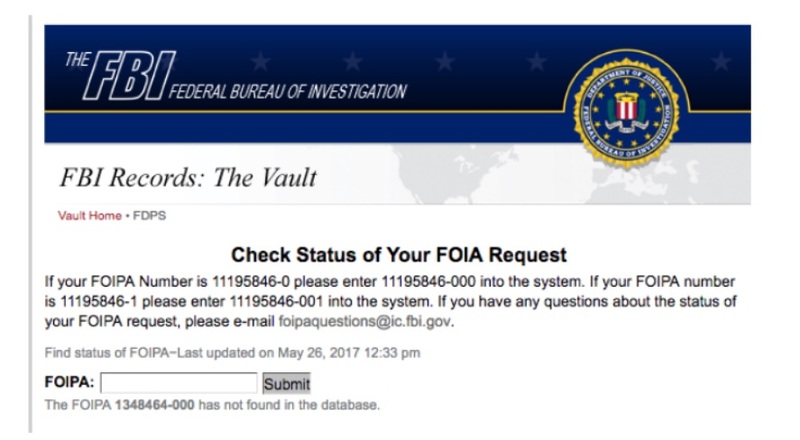 And most recently, we know that the FBI has not only repeatedly refused to release those files (despite DOJ telling them to do so) but apparently removed the request from their FOIA tracking system. In early 1981, Fred Alvarez, a tribal vice president with the Cabazon Band of Mission Indians, started complained that money from the tribe’s casino was being skimmed. Witness statements and other evidence reveals that John P. Nichols Sr., who had, in addition to his claims of a CIA affiliation, long-established ties to organized crime, confessed to ordering the hit that resulted in the deaths of the Alvarez and the others in response. Subsequent investigations have linked their deaths to a network of corruption that included organized crime, arms trafficking, partnerships with Wackenhut private security, and the government-backed modification and distribution of stolen software. 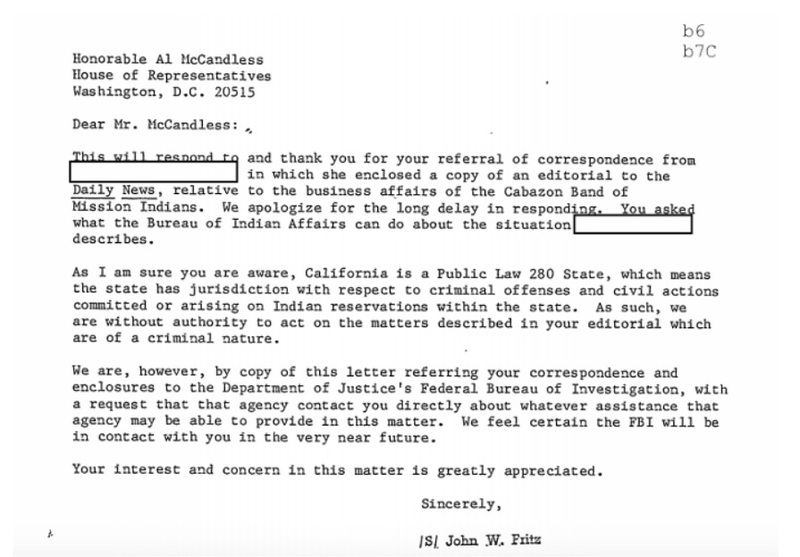 According to a previous FBI release, the matter was brought to the attention of the Bureau by the Department of the Interior’s Bureau of Indian Affairs. In response, the FBI Director requested that they follow-up on the matter and interview the reporters who seemed to have knowledge of the case. 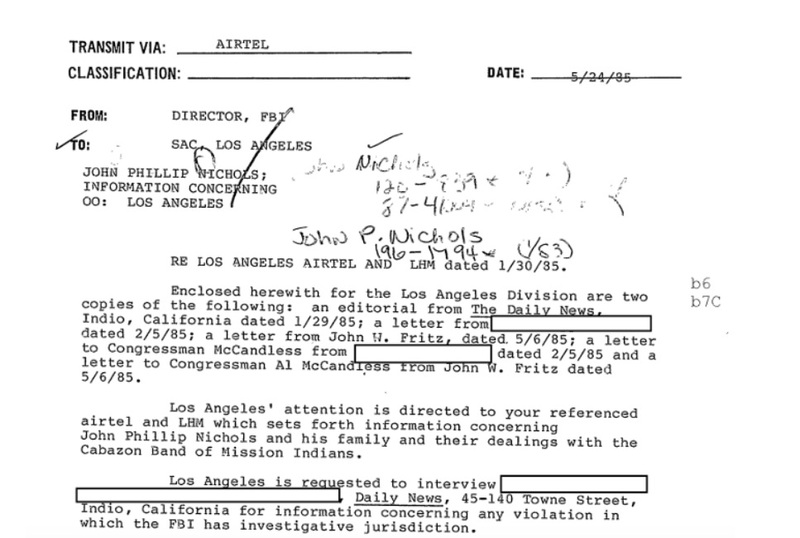 According to the response sent to the Director, the Los Angeles field office did speak with journalists about the case, and were informed that they only wished to raise the issue so that it could be investigated. The response to the Director concluded by noting that Nichols had previously plead guilty to commissioning an unrelated murder of two people he suspected of furnishing information. 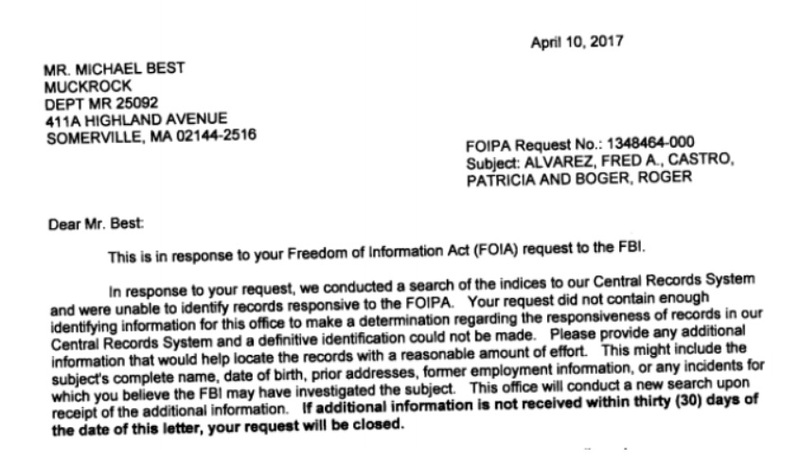 In response to a FOIA request last year, the FBI took only nine days to respond by saying that the names of the murder victims and the general location and date of their death was not enough to perform a search. 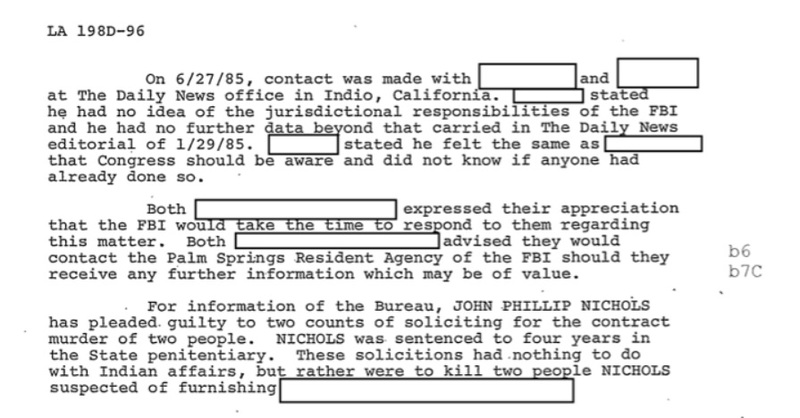 According to their letter, the FBI needed additional information, such as where the victims had previously worked, or what my basis was for thinking the FBI might have had an interest in them. One might have thought that the request explicitly mentioning a murder they investigated might have made that pretty clear, but the Bureau didn’t agree. The matter was appealed to the Department of Justice’s Office of Information Policy, which discussed the situation with the Bureau and instructed them to perform a search. In response, the FBI did nothing. 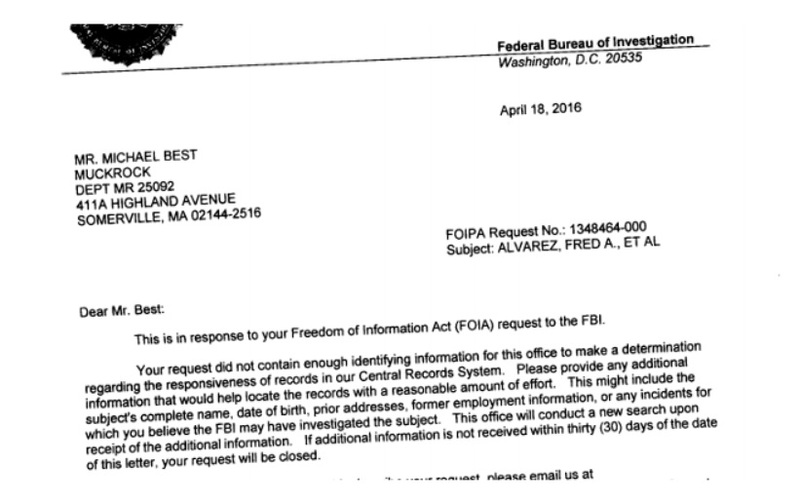 After only three months, however, the FBI sent a new letter - almost exactly a year after their original refusal to perform the search. This letter is almost identical to the first letter, which the DOJ had already rejected on appeal, with two alterations: one sentence was added, and another put into bold. 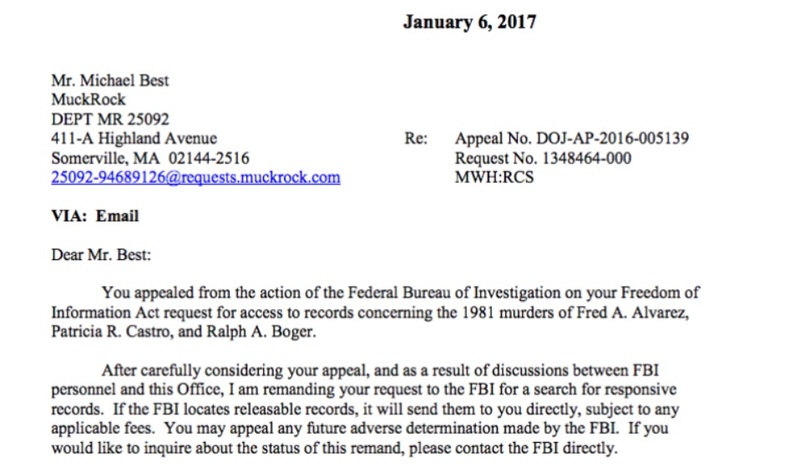 The FBI apparently felt that telling me that the request didn’t have enough information to make “a definitive identification” would somehow justify their need for knowing where the victims had worked prior to their murders. . The matter has been re-appealed to the Department of Justice, but in the meantime you can read the relevant section from the file on John P. Nichols Sr. below, or on the request page. Like Emma Best’s work? Support them on Patreon.